We are one of the biggest and trusted name of manufacture and suppliers of water treatment spare parts. We manufacture products such as Vertical Centrifugal Pumps, Water Filter Cartridges, Stainless Steel Pumps, and provide them at leading market rates. These products are made from the premium-grade raw materials procured from trusted market vendors. Our products are known for their accurate specification and long service life. These products are engineered and design to meet to the clients expectation and comes with warranty certification. Our Water Filter Cartridges are highly in demand in the manufacturing industry for their quality and design. These filters cartridges are used for water filtration at high temperature and high corrosion processing application. Our range is highly acknowledged to it sturdy construction and accurate dimension which we customize as per the specification of the clients and are bound to deliver our products in given time frame. 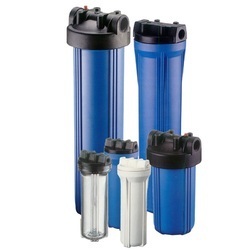 Looking for Water Filter Cartridges ?